Over 160 train lovers turned out for the day! A Thank You Note from a Railfan. BCWRR Locomotives and Rolling Stock. 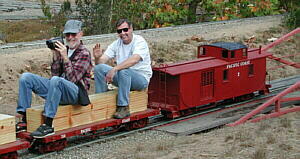 These passengers are enjoying the scenery aboard a mixed consist being pulled by No. 4751 (see the pictures of locos and rolling stock). The Northern (4-8-4) No. 4751 live steamer pulls these passengers past the depot. Here's a couple of big kids enjoying themselves. 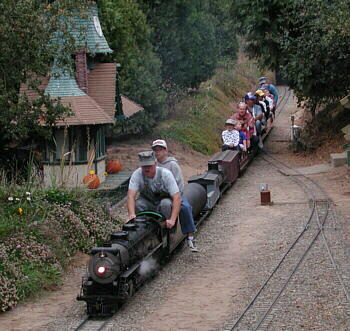 And, notice the Pacific Coast Railway caboose. A SMVRHM crew takes a "test" run early that morning. I just love this picture. 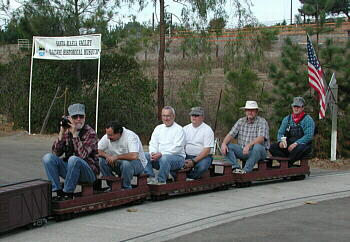 It was actually taken at a similar BCWRR event a few weeks before that benefited the San Luis Obispo Railroad Museum. Our guys did the BBQ for them that day! 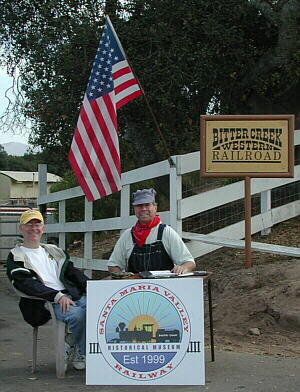 The Welcoming Committee greets folks at the entrance to the Bitter Creek Western Railroad. 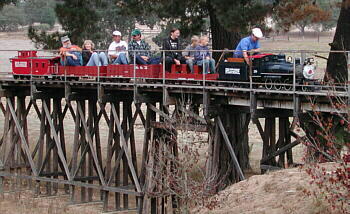 This Bitter Creek Western RR train headed by the 4-6-0 is about to exit the trestle. 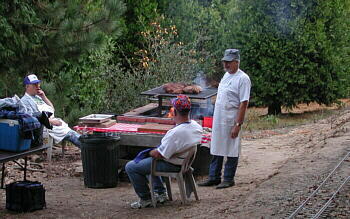 The BBQ "dining room" was in full swing from noon until 2:00pm. The Museum Gift Shop was open on site for the day. As you can see, the BBQ crew was run ragged most of the day. 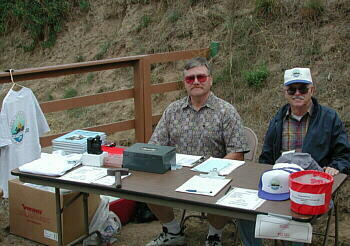 Here are photos from the Second Annual Choo Chew Saturday, June 8, 2002.